Happy Monday Everybody! October is officially National Breast Cancer Awareness Month. I want to encourage you to support this cause year round, instead of just one month. I think we all know someone who has been affected by it, the seriousness of this disease and the importance of research. Donate, get involved in sponsored marathons, purchase pink products and participate in local activities. 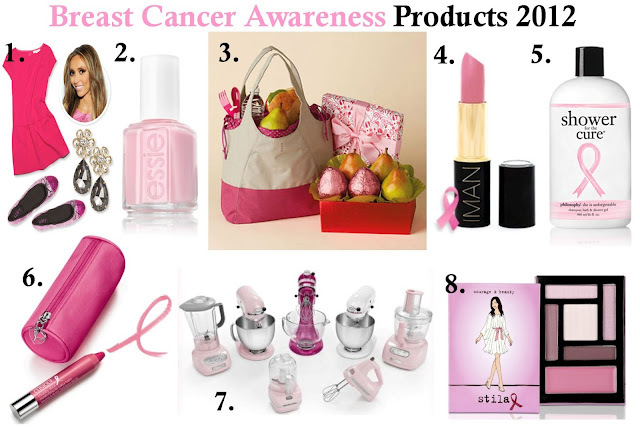 There are TONS of pink products online and in stores, however not all contribute to the cause. So be careful! If you buy PINK, make sure at least a portion is given to a reputable charity. I've attached some pink products that I thought were really nice and I'm hosting an OPI giveaway. Enjoy and Think PINK! 2. Tell me what you plan to do for Breast Cancer Awareness this month. 3. I'll announce the winner in Friday's (10/5/12) blog post! I love supporting companies' breast cancer awareness campaigns. Those nail polishes are so pretty! I'll definitely be wearing pink! I will be celebrating this month with my dear aunt who is celebrating 5 years cancer free. I'll try to see how many pink I have in my closet, will definitely rock it for a good cause! Besides getting my own exam (scheduled for Thursday) I also do a week long of posts reminding people to get their exams and also wearing a pink garment and telling stories about people i know that have had cancer. Thanks for the reminder Kim! I have a friend who always walks and I will donate to her and shop around for pink goodies too! The president of the Pussyfooters is currently going through treatment for breast cancer. I'm going to donate to her Walk for the Cure team and if I can join her team I will. What is a GFC follower? I pulled out my Pink Breast Cancer Awareness bracelet this morning and will wear it all month long. My mom is a breast cancer survivor and this is a cause that is very near and dear to me. Im wearing Pink & supporting Breast Cancer Awareness all this month. Also I'm planning to write something about Breast Cancer. Great post, Kim, and a lovely list of products! I'm definitely gonna grab some of them! thanks for another great giveaway, Kim. i might do a blog post on the related products but no solid plan for now. maybe i should do more! Fabulous post. I am so buying the OPI set! I think it's great that companies get so involved and want to help find a cure, it's wonderful to see. Hi Kimmy, I totally forgot that it's Breast Cancer Awareness month and coincidentally I actually have a pink outfit that I'll be posting on Wednesday. THANKS for this awesome giveaway and I really love you for supporting my blog! Have to read up on Rancic for Loft...sounds interesting. 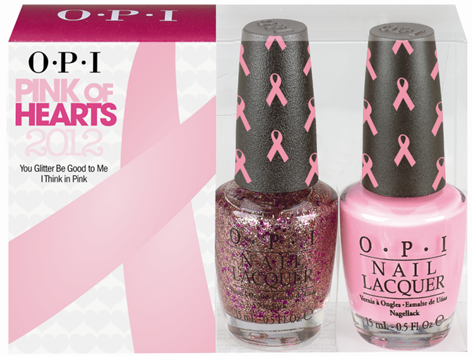 And those OPI Pink of Hearts polishes look super adorbs! I'll be hosting a pink giveaway this month too! why did i think february was national breast cancer month? probably the pink. i really love all the products that benefit the cause that come out -essie's colors are great this year! i am lucky to not be close (blood related) to anyone who has had breast cancer - it's such a large problem! i really want to pick up some of the items to help support - like the essie colors or something else. it's small, sure, but i can choose a pink, does a little good product over another. My computer kept shutting down when I was trying to leave a comment, so sorry if you got a duplicate--love this post, it's one close to my own heart as most of the women in our family have succumbed to cancer. That sparkly polish looks fabulous! Hope all is well with you Kim! I love that so many brands get involved for Breast Cancer Awareness Month! It's great to see them all involved. There are so many great ways to support this cause, you've highlighted so many that I didn't even know about! Kitchen Aid is calling ma name! Love this post Kim. It's now been just over a year since I lost my Grandma to breast cancer so this is definitely a cause close to my heart. I love companies that support Breast Cancer awareness! I usually buy the nail set from OPI every year, and wear pink on my nails for the whole month! One of my favorite causes!!!! great post! i love that companies are supporting a great cause. October is great because women come together! I will wear my pin in honor of my grandma, who died fighting breast cancer. What a great post! I'll definitely wear pink and donate! And if I win your give-away, I'll even pay a pro to make my nails beautiful! Well wearing pink definitely won't be hard for me! :o) I love when the NFL has all the pink stuff for October. So fun! I'm going the pink bracelt from dukas and estee lauder!! I'll be wearing pink, pink, and more pink, in honor of all , especially my best friend, Cindy. i'm a GFC follower of course! what pretty polish. that's an awesome giveaway! 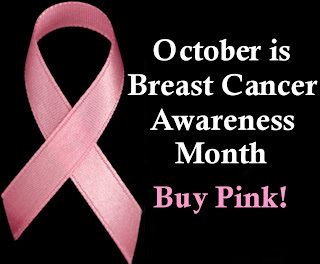 i'll definitely be wearing pink this month!!! Great giveaway and what a great way to raise awareness for the Breast Cancer Awareness Month! I LOVE all things pink, so I'll be buying the limited edition products and I'll put my change in the charity box! This one is close to my heart since a few friends of mine are breast cancer survivors. I plan to wear my pink ribbon and purchase a few of the items to support the cause. Thanks for another fantastic giveaway Kim! A great giveaway and a fantastic cause. I'm already a follower, and I guess entering this contest and wearing pink would be my contribution. Oh, and I give birth soon, so will be promoting breastfeeding, which has been proven to reduce chances of breast cancer.